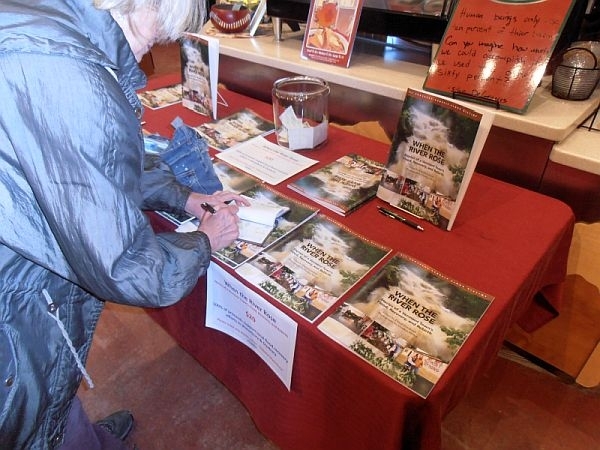 Personal stories from Tropical Storm Irene are appearing on bookshelves and at fundraisers as people continue to gain perspective on how the storm uprooted lives and changed towns forever. In Waterbury Friday night, people gathered to remember the storm with the release of "When The River Rose." The book is created by those who lived through Irene. VPR’s Patti Daniels was there. (Daniels) Adults and children crowded into the historic train station on the Waterbury green Friday night. The sounds of happy neighbors reconnecting are a contrast with the experiences that bound them together in late August. Their stories from Irene are told in a new book of photos and essays. Madeline Drake read to the crowd from her poem. (Daniels) The book of essays and photos is a fundraiser for Waterbury. But the book’s editor, David Goodman, says it’s also a record of what happened during the storm. In the aftermath of the storm he began collecting people’s stories as they were in the midst of mucking out. (Goodman) "And found, much to my surprise, and the surprise of people I was interviewing, just how cathartic it was. After these absolutely exhausting days of cleaning up to sit down and talk about what it felt like." (Daniels) Goodman has an additional vantage point on the disaster because his wife, Sue Minter, was a transportation official who worked at the center of the storm. She now leads the long-term recovery efforts. (Minter) "It’s a very moving story everyday, still, for those Vermonters affected by Irene. Even as for many Vermonters Irene is long past, for others it is very much a present reality." (Daniels) The destruction and recovery is also presented in the book through photographs by Gordon Miller, who’s lived in Waterbury for 20 years. (Miller) "There’s a series of photographs where people are almost expressionless, they’re just almost gazing out into the horizon. Like, wondering what just happened, how am I going to get my life back, how am I going to solve this problem. There were just different times during the whole recovery process where I could just see that look on people’s face." (Daniels) Resiliency was on their faces as the book was released. So was humor, like in this story read by Heidi Hall. (Hall) "I joined a small group of friends at the Bairds’ house. The Bairds’ Volvo had died getting out. Jeff Baird rescued a muddy bottle of Cuervo 1800 from the rear of his car. Was it a purposeful part of evacuation? We’ll never know. Not one to miss a moment, Jeff cracked it open — it was 6:30 a.m. — and passed it around the circle. It was a transcendent moment, if ever there was one." (Daniels) As Waterbury residents work to transcend this moment, the stories and photos continue to bond them together. For VPR News, I’m Patti Daniels in Waterbury. NOTE: The Children’s Literacy Foundation coordinated the publication of "When The River Rose." Proceeds go to Rebuild Waterbury, the town’s flood recovery fund.